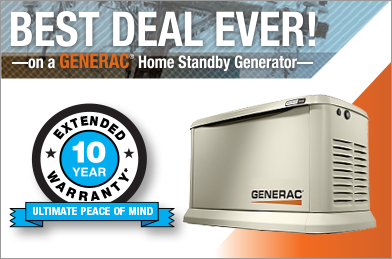 Home standby generators provide power in the event of a power failure. A transfer switch disconnects the home’s electrical system from the utility’s supply lines and connects it to the standby generator. The transfer switch isolates the generator from the electric utility to prevent the generator from energizing the utility’s wires, a legal requirement in many areas. Automatic transfer switches activate when the power goes off; manual transfer switches require you to activate the system yourself. Correctly sizing a standby generator is fairly easy, and very important. A generator that is too small won’t supply enough power. If you choose one that is too big, you’ll only waste fuel generating power that isn’t required. A home standby generator can power an entire house or selected critical circuits. Generators are rated in watts or in kilowatts(kW). One thousands watts equals one kilowatt. Appliances are often rated in amps, amperes, volt-amperes or sometimes watts and kilowatts. Deciding which electrical circuits and appliances to power in an emergency is the first step to sizing a standby generator for your home. Large appliances use the most power. An electric range might use as much as 8000 watts while a central-air conditioner can easily use 7000 or more while it is operating. The two combined will exceed the maximum power of many standby generators, so make choices carefully. Powering an electric range is a convenience and probably not a necessity if the microwave oven works. In the middle of a heatwave, air conditioners are a necessity rather than a convenience. Determine which critical appliances must have power during an outage. Important appliances include medical equipment, refrigerators, freezers, furnaces, sump pumps and well pumps. Powering these appliances keeps food from spoiling, provides heat, water and sanitation, and prevents your home from flooding during a storm. Supplying convenience circuits that power lights, computers and televisions throughout the home will increase the size and cost of the generator, and the cost of installation, but you may wish to include them if extended power outages are common in your area. On the other hand, by making careful choices, including a few lighting and convenience circuits won’t necessarily increase the size or expense of a generator intended mainly for critical electrical circuits. Make a list of the devices the standby home generator will power and divide it into two sections; one for critical circuits and a second for convenience circuits. Record the power requirements for each device in watts. Power requirements may seem confusing, but are easily converted. A specification of volts-amps is the same as watts (1200 volt-amps = 1200 watts.) If only the voltage and amps are given, multiply the amps by the volts to obtain watts (120 volts x 10 amperes = 1200 watts.) Convert kilowatts to watts by dividing by 1000. Determine start-up power requirements of appliances with electric motors. Electric motors require more power while starting than while operating at speed. Sizing the generator must include the startup power requirements. If the appliance documentation does not provide the startup current or requirements, contact the manufacturer. Add up the power requirements of the all the circuits required. Divide the total by 1000 and round the result up to nearest whole number to determine the kilowatts necessary. Select a generator based on the number of kilowatts required, but keep in mind that a generator with a bare minimum capacity is rarely recommended. Stepping up ten, fifteen, or even twenty five percent is better. If you determine you need 14 kilowatts, select a generator that will provide 15 or 18 kilowatts instead and you won’t worry about turning on a few extra lights or overloading the generator.